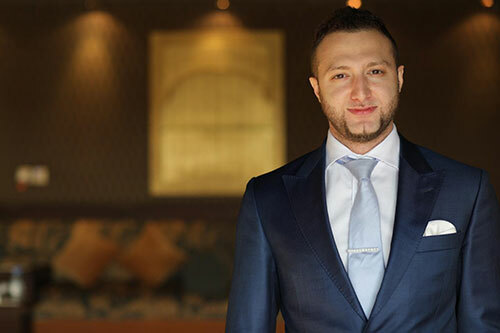 Czech Rehabilitation Center is considered the first of its kind in the Kingdom, following the world-renowned Czech methodologies in Physiotherapy and Rehab. Czech Rehabilitation Center treats and rehabilitates more than 400 patients daily, these patients are treated by world renonwned Czech specialists using the latest physiotherapy programs. 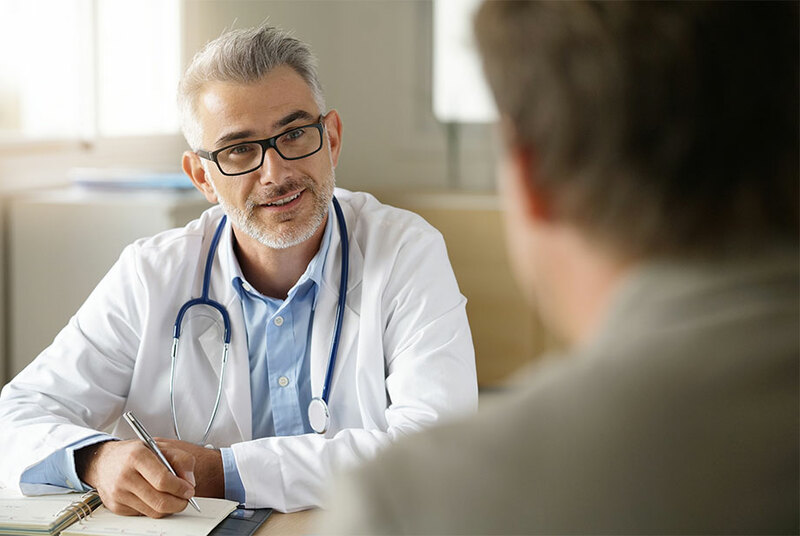 Patients undergo intensive and concentrated treatment plans in accordance to their medical condition/case. 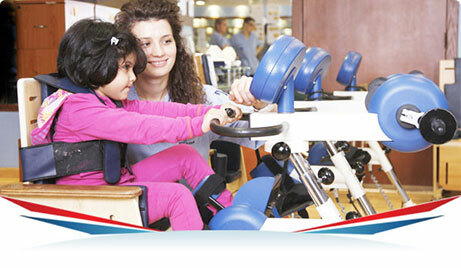 The role of the Czech Rehabilitation Center doesn’t stop at giving distinguished medical service to its clients only. We believe that it is part of our corporate social responsibility to play an active and effective role in serving the Saudi society. At Czech Rehabilitation Center, serving the society comes first, hence our clients genuinely trust us to support them to realize the best results possible. Through these beliefs and our core values; we aim and and continue to strive to be a specialised medical pillar, in KSA, offering unprecedented physiotherapy and rehabilitation services. To be known as a unique center which enhances good and continuous care to meet the patient’s needs. In addition to the main aim at providing a complete distinguished medical service; Czech Rehabilitation Center is always committed to provide the latest technology in physiotherapy and rehabilitation. Our commitment to respect, trust and honesty are the foundational values of our corporate culture. In synergy with this are our professional ethics, which focus our full team energy towards collaboration, productivity and results. Our teams of highly specialized individuals thrive on, god willingly; making what seems to be impossible to our client – now possible. Our approach is rigorous and intensive, adapting the most advanced and world-renowned Czech rehabilitation and physiotherapy methods and techniques to allow our client to reach their full physical and mental potential. 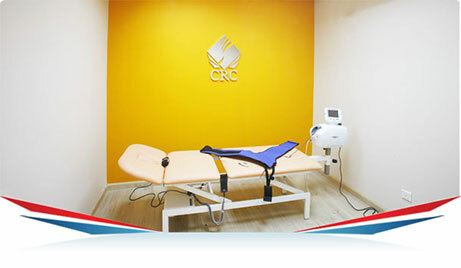 Established over a decade ago, the CRC today offers unprecedented rehabilitation and physical therapy services in a unique outpatient setting. Our Corporate strategy is to expand through both new Greenfield locations and operating of new sites for other healthcare providers to enhance their rehabilitation and physical therapy offerings. This will not only grow our business but more importantly allow us to extend our reach to the community and to help those in need of our services. On behalf of the Board of Directors and the CRC team, we look forward to serving you in the best way possible. Physiotherapy is based on the physical factors in the human body through the usage of several treatment methods and the doing of some moves whose function is to benefit the human body i.e. Physiotherapy is based on the usage of means that aim to cause certain reactions in the body to affect the function of a specific organ or all the organs. It is the science and art of evaluating people with motor and psychological handicap from all the physical, physiological and cognitive sectors for all ages. it also aims for creating a balance between life requirements and focusing the energy of a person, and the ability to solve problems and regard life from a reasonable perspective. it is from the supportive services and one of the paramedical jobs. It is a therapy that aids weak muscles in motion, when the body floats above the water. in this case, water resistance creates a certain kind of balanced resistance exercises that helps the body regain its vitality after general conditions of weakness, periods of convalescence or after surgeries. It is a device where the patient is placed on a chair or bed and places the limb he wishes to treat (upper or lower) inside a cylinder of high pressure or low one. this remedial action doesn’t cause any pain. the air pressure device aids in the treatment of (ulcers – cuts caused by diabetes – expanding blood vessels – increasing blood pumping – activating cellulites and fixing it). It’s a treatment that serves as a means of improving the functions of the blood and lymphatic circulations and which positively affects the treatment of several diseases through pumping the air inside a special suit rotationally. 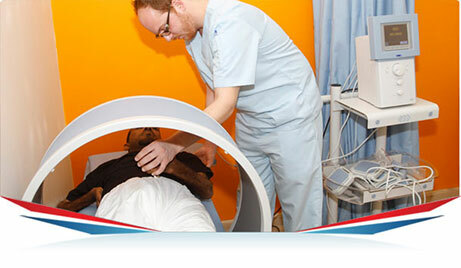 The laser treatment is considered one of the most modern ways of physiotherapy to relieve pain. it is known that laser is used in many fields and that it is one of the special ways to treat without surgery. this resides in the fact that it has the ability to stimulate the body to emit substances such as endorphin and serotonin. It is a way of treatment that works on increasing blood flow to the area where the hot packs are applied, since they help to expand blood vessels in the area. 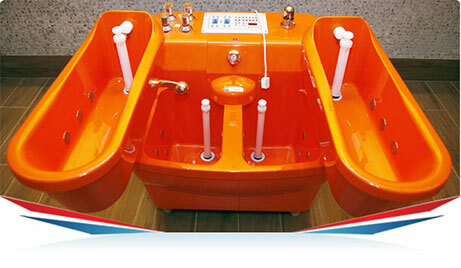 this results in a minor and ineffective decrease in blood pressure; therefore, the person feels relaxed and comforted. hot packs help in muscles relaxation so it is impossible to sense muscles pain, the pain that arises from stretching them and this activates the blood circulation. It is a pool which contains several openings, one which allows water to enter the pump and others are dependent on the size of the jacuzzi and capacity. the pool is filled with water, which can be done manually by mixing hot and cold water, according to the environment. It is a complementary section for other treatment sections by the usage of technologically developed equipment that work to improve the performance of the patient in terms of joints movement, level of strength and motor coordination. The massage is working on the body by applying pressure (consistently or randomly; stable or unstable). movement or shaking is made manually or mechanically. the tissues targeted can be muscles, ligaments, tendons, tissues, skin, joints, any compact tissues, lymphatic vessels and digestive organs. the massage process can be done by using hands, fingers, elbow, knee, arm or foot. The gym is considered one of the treatments that helps maintain the body flexibility and physical fitness of the patient through the usage of different sport equipment. 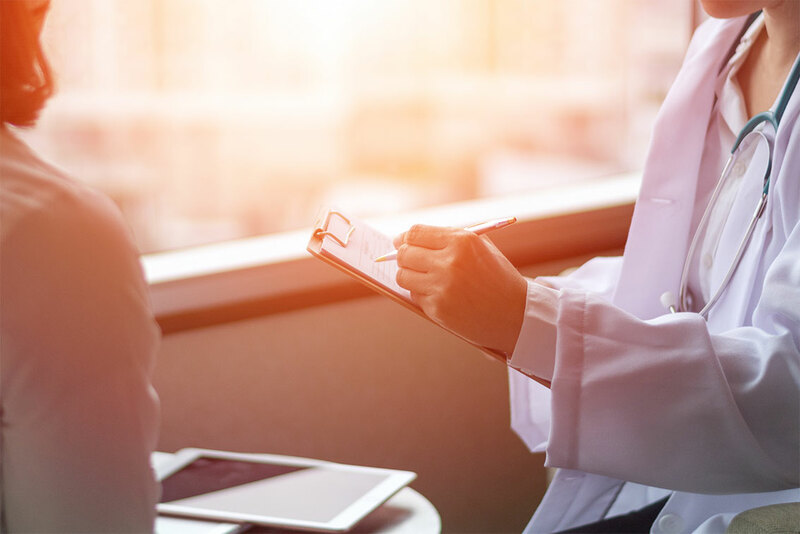 the types of exercises differ according to the case in which the therapist defines a specific treatment program each patient according to the nature of his body and health condition. the therapist merges different types of treatment programs to reach the perfect and ideal body. 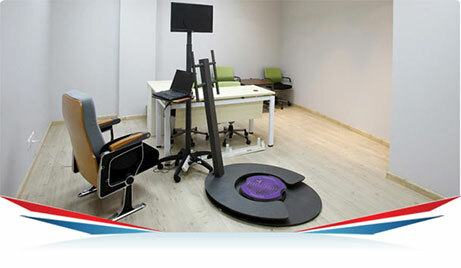 it is a device that is controlled by the computer and a program supplied by several systems that helps maintain stability and balance of the body, measure the body balance and offer motivational exercises. In orthopaedics, traction and attraction treatment indicate to a group of straitening mechanisms, strengthening broken bones and lowering pressure on the spinal cord and skeletal system. studies have indicated that a growing number of orthopediatricians utilize traction and attraction treatment as exercises using girdles or a device for stretching the spinal cord and the abdominal muscles. It is an alternative treatment for fitness activities or aerobics exercises; moreover, it can be applied with the presence of the therapist. it also combines between effective exercises session and modern rehabilitating ways. This department depends on a device called (lokohelp) which consists of a robotic cast which helps the patient to walk during the training session; it has a mobile belt to support the patient’s back for the balance. here the movements start in an automated way. this device has a high sensitive system to perfectly match between the way and speed of the walks and the belt movements which supports the back. 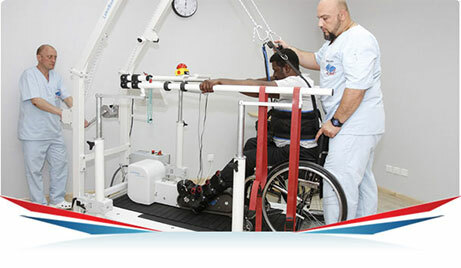 this happens without any manual support from the physiotherapist even with those who are not able to walk completely. Magnetic therapy is one of the means of physiotherapy treatment, that uses the magnetic energy to cure a great range of diseases that attack the body. when the magnetic energy penetrates the skin in a specific location, it would be received by the blood vessels of that area and be transported by the blood to the main blood route which nourishes all the blood vessels in the body. If you would like to start a career with CRC.